Card Text Bigtwig can only fight stunned creatures. Reap: Stun and exhaust a creature. Does Bigtwig deal damage when it is attacked? Yes. The restriction that Bigtwig can only fight stunned creatures only applies when using Bigtwig to fight (to attack an enemy creature). For purposes of card effects, the attacked creature doesn’t “fight” – only the attacker “fights” – but both creatures are considered to be “fighting”. 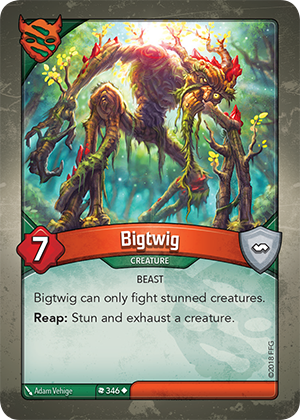 Therefore, Bigtwig deals damage to the attacking creature normally, following standard rules for fighting. How does a creature operate if it is both stunned AND exhausted? A creature that is both stunned and exhausted will remain exhausted through the end of its owner’s next turn, at which point it will become readied, but remain stunned. The next time the stunned creature is used (i.e its owner can legally attempt to fight, reap, or use another ability), the creature follows normal stun rules: the attempt to use the creature fails, the creature becomes exhausted, the stun token is removed, and the creature will be readied during the Ready Phase (at the end of its owner’s turn).